Featured amenities include complimentary wired Internet access, dry cleaning/laundry services, and a 24-hour front desk. Free self parking is available onsite. A stay at Hotel Centro Bodrum places you in the heart of Bodrum, a 4-minute drive from Bodrum Amphitheatre and 6 minutes from Bodrum Marina. This family-friendly hotel is 2.1 mi (3.4 km) from Bodrum Bar Street and 2.2 mi (3.5 km) from Bodrum Beach. Enjoy recreation amenities such as an outdoor pool or take in the view from a garden. Additional amenities at this hotel include complimentary wireless Internet access and barbecue grills. 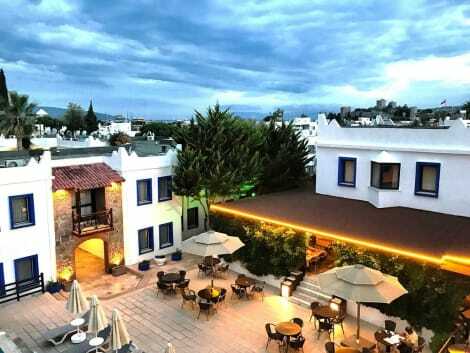 Salinas Hotel Bodrum, the sea, 30 meters away from the night life just a 5-minute walk from the famous Bar Street Gumbet. The hotel's outdoor swimming pool, children's pool, and has bright rooms with a balcony. All rooms have air conditioning, satellite TV and telephone. There are private bathrooms with shower and hair dryer. Salinas Hotel's on-site restaurant and bar serving Turkish and Mediterranean cuisine is available. Guests can also play table tennis. Hotel Salinas, Milas-Bodrum Airport is 35 km away, and the nearby bus station is 4 km from the center of Bodrum. warm atmosphere of a true vacation paradise with the possibilities of Salinas Hotel Bodrum, swim in the pool while adding enjoyment your child will enjoy the fun in the children's pool. Snack after a table tennis tournament, what do you think? Is not it better? A stay at Asmin Hotel Bodrum places you in the heart of Bodrum, within a 10-minute walk of Bodrum Beach and Bodrum Maritime Museum. This hotel is 4.7 mi (7.6 km) from Bitez Beach and 8.9 mi (14.4 km) from Camel Beach. Enjoy recreation amenities such as an outdoor pool or take in the view from a terrace. Additional amenities at this Mediterranean hotel include complimentary wireless Internet access and tour/ticket assistance. If you're planning a day at a nearby theme park, you can hop on the shuttle (surcharge). At Otel Atrium, enjoy a satisfying meal at the restaurant. Wrap up your day with a drink at the poolside bar. A complimentary buffet breakfast is served daily from 8 AM to 10 AM.